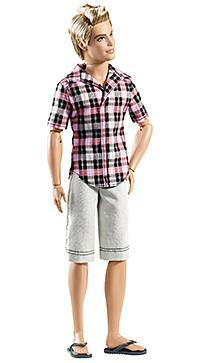 Any girl who wants to pair her Barbie doll up with a date knows she can always turn to the Ken doll. With his six-pack abs, perfectly-styled hair and stylish clothes, Ken is the perfect complement to the beautiful Barbie. Whether you prefer Malibu Ken, in his trunks and sunglasses, or Biker Ken, with his leather duds and scruffy face, there is a Ken doll to fit your dreams. 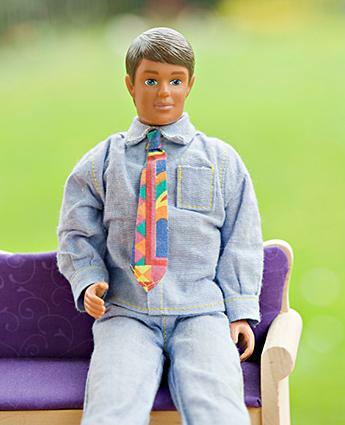 Ken has undergone several changes over the years since first being introduced in 1961 by Mattel. As with Barbie's history, the Ken doll has held a huge number of occupations; he's also been a blond and a brunette. 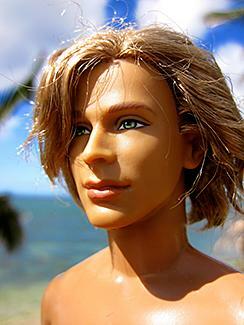 The earliest Ken had felt hair, but it was soon replaced with molded plastic. He also went from being designed with straight, unbendable legs to legs that bent at the knees, making it easier to pose him in sitting positions. Anyone who knows basic Barbie history facts knows that Ken is her boyfriend. However, when they split in 2004 it was big news. It was reported in 2006 that the couple had reconciled after Ken was revamped, but if Barbie and Ken are anything like most celebrity couples, who knows how long their romance will last? The 1961 Ken was a clean-cut, blond-haired, blue-eyed doll. Although some of his looks have been flamboyant Ken remains a beloved childhood toy for many girls. Even though Ken is a male doll, he remains a popular girls' toy. After all, when girls want to marry off their Barbie dolls, they need a suitable male figure to be the groom. Talking Ken (1968) came with a stand and was able to say several different phrases. Live Action Ken fit right into the grooviness of the 1970s in his polyester-themed outfit and vest. Colorful and vibrant, he stood on a motorized stage and could be posed into all the latest moves. He also came with a play microphone. Busy Ken was indeed kept busy with hands that opened, closed and held onto objects like play telephones, televisions and travel cases. Dressed in light brown pants, an orangish-brown jacket and a yellow shirt, he may not fit in with today's business crowd, but he played the part well in 1971. The 1971 Malibu Ken was all ready for the beach. Dressed in swimming trunks and accompanied by sunglasses and snorkeling gear, girls everywhere made sure this tropical Ken and Barbie hit the shore all summer long. Sport & Shave Ken, introduced in 1979, was much hairier than his earlier counterparts. He came with a marking pen that could be used to draw on a beard (or five o' clock shadow), which could then be "shaved" off. No Ken collection would be complete without 1980's Disco Ken, who fit right into the tail end of the disco era. Dressed in sparkling gold suspenders, bow-tie and flashy white pants, he and Barbie could dance the night away. Western Ken was another 1980 variation whose ruggedness was a marked contrast to his disco-dancing days. The Crystal Ken doll of 1983 was dubbed "the handsomest Ken ever." Dressed in a white suit and topped with brown hair, he was certainly a sharp-dressed man. Exercise Ken fit into 1983's obsession with all things exercise, whether it was a Jane Fonda workout tape or Olivia Newton-John's hit Physical. Flight Time Ken, introduced in 1989, was dressed as a pilot and came with a pilot cap and briefcase. The 1998 Biker Ken doll was a drastic departure from his clean-cut days. He had long, dark brown hair and was dressed in ripped blue jeans and a black "leather" jacket. The New Look Ken of 2005 had a shaggier hairstyle and was wearing casual duds: jeans, an overshirt and a tee shirt that says "I'm Back." Ken has undergone a transformation and is now hipper and more good-looking than ever. Sweet Talking Ken makes the perfect boyfriend because he only says what you tell him too. He has a microphone built into his chest so you can record phrases, then customize the pitch when you play them back. Shaving Fun Ken needs a shave and girls can actually shave him. He comes with a sponge-head razor which, when dipped in warm water, shaves him clean. With cold water, his beard comes back. Groom Ken is ready for his wedding day. His look is regularly updated, sometimes featuring a white tuxedo jacket and black pants, other times with a silvery black jacket and dark silver pants or in a classic tuxedo. Bathing Suit Ken's abs are on display as he gets ready for the beach. With his primary-colored swim trunks with diagonal stripes and a towel, he is ready to have fun in the sun. A Mermaid Tale Ken is also ready to dive into the ocean with his turquoise swim trunks. A pair of sunglasses is perched atop his head and he wears a classic shark tooth necklace. Handsome Doctor Ken comes paired with Barbie in the exclusive I Can Be Doctors set. Ken is dressed in the traditional doctor scrubs and lab coat, with a stethoscope hanging around his neck. In 2011, Mattel brought back the original Ken doll. This 50th anniversary doll is ready for the pool in his red bathing suit, sandals and towel around his neck. After a day in the sun, he can head to the dance in a blue blazer, crisp white pants and loafers. 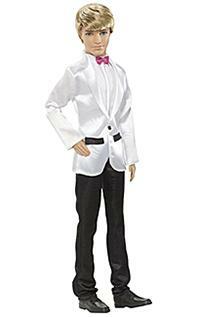 Ken's closet rivals Barbie's with all of the different outfits and costumes he has. Whether you want to dress Ken up in a tuxedo or dress him down in shorts and tee, you can find the perfect outfit. Don't forget the shoes either, Ken has a large collection of those too. The selection of Ken clothes may be limited in the Barbie aisle of toy stores, but you can find a wide range of clothes for dressing up Ken online. Doll Clothes Superstore has a wide variety of Ken clothes, from shiny robes to sporty shorts outfits and even camouflage duds. You can also buy flip-flops and slip-on shoes and multiple costumes, such as a Santa Claus, Peter Pan or Dracula outfits. Websites such as eBay and Etsy feature individuals who sell vintage and handmade Ken doll clothes to enhance your wardrobe. The Ken doll has undergone a multitude of looks and changes, mainly to fit in with the times and what was going on in pop culture. Whether you like him as blond, brunette, pilot, tennis star or disco-dancer, Barbie will always be glad to have her handsome date on her arm.